A new expression of church that participates in the evolving story of God told through sacred narratives, wilderness and our lives. Church is not a building or a set of beliefs, it is a Conversation. Church of the Wild is a gathering for those who are allured by the call into the Great Conversation between all things as a pathway to personal wholeness and societal transformation. 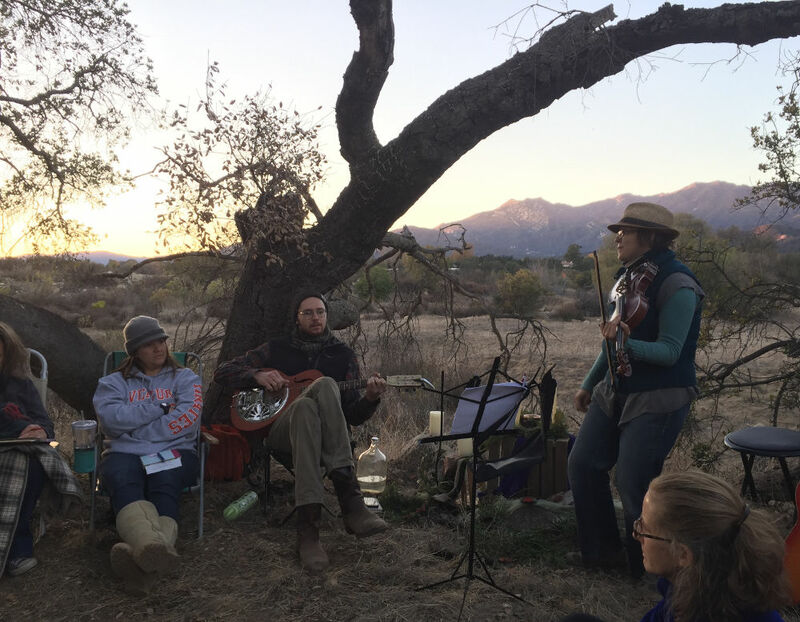 We meet outside, on the edges of Ojai’s wilderness, because nature reflects not only glimpses of God, but mirrors an inner reality as well. This call to the edges is a call to wildness, to our True Selves, to a direct encounter with God through the face of nature and one another. In the beginning was the Conversation. And the Conversation was with God. And the Conversation was God. We meet once or a month under surviving oak trees, beside rivers, in the ashes, observing new life, restoring our relationship with the land and the creatures of our watershed as sacred practice. We meet in different places throughout the Ojai wilderness (where trails are open) so check the Facebook page or sign up to our email newsletter (below) for locations, directions, and carpool information. We are keeping an eye on the trails re-opening since the fires and will update locations as the dates get closer. We do regularly meet, however, at "our oak tree" off the Oso Trailhead, across the creek and to your left. Bring a short folding chair, water and a journal. More information on our Facebook page or via our email newsletter (sign up below). We meet outside, usually on Sundays. in different spaces throughout the Ojai Valley, on the edges of the wilderness. Preachers include blue jays and barren river bottoms and thistle down. as well as the works of mystics, poets, visionaries...and one another. Church, to us, is a place where Mystery is experienced, not explained. SEEKING AN UNTAMED GOD AND SPIRITUALITY. The wilderness of our Ventura River watershed is more than a beautiful location to experience the presence of God. Wilderness is where God calls people throughout history to change their identities, to surrender their small visions and open up to larger ones, to step into their callings to be agents of restoration to a broken and disconnected world. From Sinai to Mount Horeb to the Judean desert to Gethsemene, to Ojai, wilderness is a context for transformation. Church is a call to deep discipleship, where we reclaim the wild call of our own souls to bring about restoration of a dislocated planet and people. Contact nafziger@gmail.com for more information.